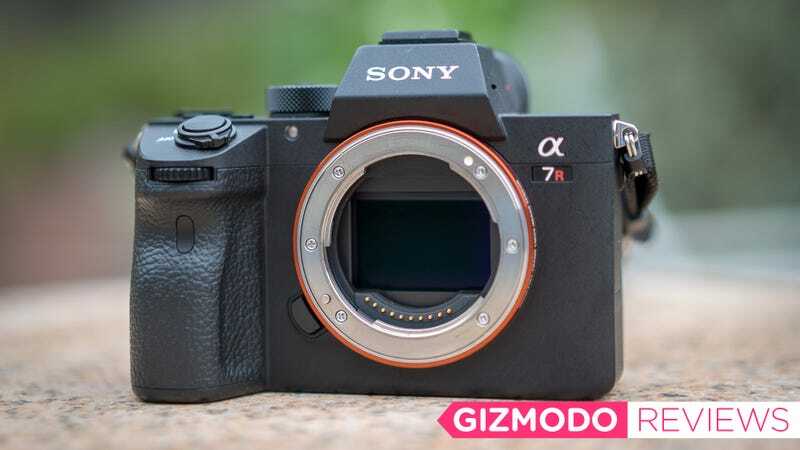 On specs alone, the $3,200 third generation of Sony’s mirrorless A7R camera, is a monster in all the right ways. It can shoot 42.4 megapixels RAW photos at an impressive 10 shots per second. It can shoot 4K video at 30 fps, or 1080p video at up to 120fps, for silky slow motion. Sony claims 15 stops worth of dynamic range. It’s light, it’s easy to handle, and it’s filling up my external hard drive way too fast, but dammit if I don’t care. After using for a few weeks for this review, I’m pretty damn sure I’m buying it. For starters, I’m sold on mirrorless cameras, even at the professional level where cameras cost north of $3,000. Yes, you can go with a Nikon D850 (the A7R iii’s closest competitor), and you get 46 megapixels and arguably better color accuracy (and certainly better lens options), but the Sony is smaller, lighter, faster, and because it has fewer moving parts (i.e. there’s no mirror that’s physically moving around), there are less mechanical things that can break. More importantly, once you use the A7r III’s electronic viewfinder, it is very hard to go back. Not only is it handy for reviewing shots in the bright sunlight, but you can utilize things like focus assist (which digitally zooms in when you’re trying to manually focus), and you know the depth-of-field of the resulting shot is going to be exactly what you’re seeing in real-time. The A7R III’s electronic viewfinder has been upgraded to 3,686,000 dots (from 2,359,000 dots on the mark II) which makes even small details extremely sharp. For a bit of context, there are three cameras in Sony’s Alpha 7 line, all of which have slightly different full-frame image sensors. The new A7R III is the third version of the most “pro” model, with a ton of manual controls and extremely large 42 megapixel photos. The A7S (of which I’ve been using the original model until now) is the master of low-light shooting, but it tops out at 12 megapixels. The straight up A7, which is also three versions deep at this point, is kind of the in-between model, with 24 megapixels. There’s also the 24-megapixel A9, which is Sony’s most-expensive model and is aimed primarily at sports and nature photographers, for whom high-speed shooting is of the utmost importance. What blew me away more than anything else on the A7 III is the dynamic range. Sony claims the A7R iii has 15 stops. That is bananas. For the layman, we’re talking about how wide the range is between the lightest thing and the darkest thing within a photo where both are still usable. The benchmarkers at DxOMark’s landscape test had it come in at 14.7 stops (they test cameras at their lowest ISO which should give the maximum dynamic range, though we take these results with a grain of salt), which is very close to Sony’s claim. To test it myself I shot some very dimly lit subjects in the front with some very bright backgrounds. Here are a couple prime examples of what I’m talking about. 1/125 seconds, f/4.0, ISO 50, edited. 1/1000 sec, f/4.0, ISO 100. Unedited on the left, and edited on the right. These were instances where the lights looked blown-out and the foreground seemed way too dark. I thought for sure these shots would be unsalvageable. Nope. A dynamic range this large, essentially, gives you the option to make any of your photos HDR, without having to shoot multiple shots to make a real HDR. There’s just so much flexibility in post-processing (I use Adobe Lightroom Classic CC, primarily) that it almost makes judging the lighting idiot-proof. You still want to be in the right ballpark, but if you can get yourself to the parking lot of said ballpark you’re probably fine. 1/250 sec, f/4.0, ISO 100. Unedited photo of a very good kitty. Moments later, same settings and angle. Near full crop to show detail. The 42.4-megapixel image gets close to very high-end medium format cameras (think Hasselblad 1XD, which is 50 megapixel) in terms of resolution. RAW files are now captured in 14-bit, up from 12-bit, which provides improved depth and detail. But what’s fairly incredible about the A7R III is that it somehow manages to not sacrifice speed. It can shoot 10, full-sized, 14-bit, RAW images per second, while refocusing between each shot. For comparison, the Sony A9, which is the current speed-master of the camera world, shoots 12 uncompressed RAW shots per second (up to 20 with compressed files), but the photos are almost half the size and only 12-bit. Personally, 10fps is more than enough for almost everything I shoot. I shot my friend practicing his ollie on a skateboard and waves crashing in on some rocks, and in both instances simply holding down the shutter button captured the precise moment I was looking for. Also, to be clear, the difference between 12-bit and 14-bit RAW photos is almost completely undetectable to the human eye. It pretty much only makes a difference if you really screwed up the exposure (14-bit will give you a little more data to work with to recover details that were accidentally over or under exposed), but they take up about 50-percent more storage space than 12-bit. Choose your own adventure. The A7R III has an impressive auto-focus system, with 425 contrast AF points and 399 phase-detect AF points. It also has improved eye-tracking over previous models, and I found that it worked well even in fairly dim conditions. The camera has also, finally, added a joystick to help you set your focus point while looking through the electronic viewfinder. It also has an improved in-body, five-axis image stabilization, which can save a handheld shot from being blurry when using slower exposures (Sony claims it’s good for an additional 5.5 stops of exposure). There are other improvements you’ll only notice if you’re really squinting at the specs. The tilting LCD screen is now touch sensitive, and it’s now 1,440,000 dots, up from 1,229,000 on the previous version. It’s also added a second SD card slot, which is great, but only one of the slots supports the faster UHS-II cards, while the other is stuck at UHS-I, which is somewhat annoying. I honestly can’t fathom why Sony made this decision (it’s the same on the A9), but it certainly isn’t a deal-breaker. There’s also a USB 3.1 type-C port, which makes transferring files to your laptop way faster. Sony’s improved image processor also writes data to your SD card up to 1.8 times faster, though if you’re shooting RAW the cache maxes out at 30 shots, so you’ll have to wait a few seconds before you can start shooting again. While I never missed a shot because of this, a lot of the menu is locked off while the images are caching, which is frustrating. Overall, shooting with this camera was extremely refreshing. I would take it tidepooling at the beach around sunset, when the difference between the dark stuff in the water and on the rocks and the bright sky was massive. No problem. 1/125 seconds, f/4.0, ISO 6400. Surprisingly low noise. I took some shots at higher ISO (that’s the sensor’s sensitivity), and found that while shots get noisier as the ISO gets higher, as you’d expect, photos were extremely usable even beyond 6400. Throughout my testing I found colors to generally be rich and vibrant but also very accurate. They aren’t over saturated, they just look great. Clear nights were scarce during the few weeks I had the camera, but when the stars finally poked through I managed to grab a few long-exposures and was really happy with the results. There has been a controversy around Sony’s high-end cameras known as the “Star-Eater” issue. Basically, the cameras were doing an automatic noise reduction during long-exposures but unfortunately that caused the elimination of smaller stars. I did a direct comparison with my Sony A7S, using the same settings and the same lens, and while the A7R III image is a bit darker I could not find any missing stars. Sony A7S: 25 seconds, f/2.8, ISO 6400, unedited image. A7R iii: 25 seconds, f/2.8, ISO 6400, unedited image. No “star-eater” effect visible. Nice, right? But that’s shrunk way down to fit on this page. Remember, these images are massive. Here’s a 100% crop of that same photo. The detail is just remarkable. Of course, there’s a price to pay for all that detail. RAW photos generally come in around 80 megabytes each. That eats up your storage mighty fast, which means you’ll be buying more storage more often to keep up. 4K video is another storage-eater, but the footage the A7R iii produces is gorgeous, and it does an excellent job of smoothly auto-tracking focus while recording. My aging MacBook Pro (2013… I know, I know), definitely struggled with these larger files, and it significantly slowed down my editing process, which is something you should keep in mind if you’re thinking about buying this thing. One feature that video-shooters will flip out about is that when shooting 4K video the camera can simultaneously shoot 720p proxy files. In plain English: 4K video is really taxing on your computer while editing, which can make the video choppy and hard to review as well as cause major performance issues on your computer. Many videographers solve this by importing their 4K footage, and then using a program like Adobe Media Encoder to create smaller, lower-resolution files. They create their edits, using the smaller files, and then use the full resolution source video when they export (Adobe Premiere makes that easy). The camera simultaneously creating those proxy files (they show up in a separate folder with the same filenames as the originals) will likely save me hours on every major edit I do. There are certainly some niggling things about the camera. The start/stop video recording button is way too close to the EVF, which makes it tough to reach while your eye is pressed up against the camera. I also found that occasionally my nose would somehow move the focus point way off center while I looked through the EVF. Overall, though, the build of the camera feels extremely solid, and it’s more comfortable to hold than my smaller A7S, with a deeper grip. Sony rates the battery for 650 shots, which is a massive improvement over my A7S, but it’s a very, very long way from the Nikon D850, which is rated to nearly three times that. Also, Sony’s main settings menu is still 36 pages long and is still very unintuitively laid out. How it’s let this issue go unaddressed for so long is baffling. Its Play Memories smartphone app is ugly and frequently buggy, too. The verdict is that this camera is absolutely amazing and is unarguably one of the best cameras you can buy, period. But it’s also overkill for most people. Ultimately, it’s aimed at professionals. But then here I am, trying to segue into the realm of professional photography. I’m at the point where I want to start printing my work, and those 42 megapixels will let me make awfully large prints before pixels start becoming obvious. It also has the humongous amount of data that gets captured in each shot, which allows me to do so many more things with lighting, contrast, and color. I drooled over the Sony A9’s speed, but ultimately I don’t shoot sports very often, and the $4,500 price tag wasn’t something I could justify. The A7R III is the better camera by nearly every metric (except for high speed burst JPGs), and it comes in at $3,200. No, it isn’t cheap, but it’s the camera I’ve been waiting more than three years for, and it’s time to finally pull the trigger. I can’t wait.